The July column for "Dancer" is being written in April (at least a month earlier than normal). I am once again going to the UK. Of course at the time of writing the British are experiencing the "foot and mouth" disaster. The Irish World Champion Dancing Competition has been cancelled and some of the Highland Games in Scotland with their dance competitions. Hopefully, by the time you are reading this column the situation will be more positive. Things do change from month to month year-to-year, decade-to-decade. There has been much made of the film "Billy Elliot" and the male dancer. I would like to introduce you to two such dancers, Bobby from the beginning of the last century and Lewis from this one. When the "Great Bobby Cuthbertson" put on his dancing shoes in the Highland arena he was in the majority. In those times it was the women who were fighting to break into the male dominated world of Highland Dance. Bobby Cuthbertson went on to be one of the Highland Greats! Mr. R. McNiven Cuthbertson a native of Springburn, Glasgow, Scotland. Cowal Champion 1910-11-12-13. Passing over into professionalism in 1914. He was just beginning to make his mark in that sphere when "war" (WW1) called him as well as others. Serving first in the Argyll and Sutherland Highlanders and then later in the Gordons, he utilized some of his leisure moments in France in winning championship of the 51st Division, the Canadian Brigade Medal and the Army Championship. On his return to civilian life he started the habit that has become the despair of every other dancer, that of lifting 90% of the first prizes he competed for. Among these were the Northern Meeting at Inverness, the Argyllshire Gathering (six times) and the Royal Braemar Society Cup four times. He received his training from Neil Cameron, Esq. and he has, in his turn, passed on that training, with his own experience added. To A.D. Cameron and Wm. 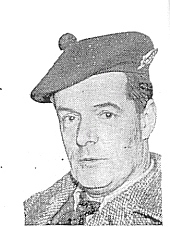 McNiven, who are among his most active competitors today (1935). He has produced a host of other dancers, some of whom are well known and others who are not so well known; but in the aggregate they must have collected the bulk of the prizes that are on offer. In action (if such a phrase can describe Bobby Cuthbertson), he is the embodiment of graceful ease that, combined with a mathematical precision, makes dancing look an effortless accomplishment, which can be acquired by anyone, is unquestionably the hallmark of supreme ability. We doubt, if there has ever been such an able dancer in Scotland, and we believe it will be may a long day before we see his equal, and we do not think we will ever see his master"
Charlie Mill, the only Scottish Judge to have had the honor of adjudicating the New Zealand Championships (70th Anniversary Highland & National Championship) and of the BBC production "White Heather Club" fame, columnist, was also a student of the "great" Bobby Cuthbertson. "Bobby was my teacher from around 1948-54, when I traveled through to his studio in Berkley Street in Glasgow every Sunday to have lessons. Before that I had been going to classes in Dundee with a local teacher who introduced me to Highland Games." "I was only about 6 or 7 and at most games this guy kept mentioning to my mother that I had great feet but was being wasted at my present teacher and kept insisting he could improve my dancing 100%. At the time we thought he was just a dancing teacher who was touting for pupils! But later we discovered he was Bobby Cuthbertson, who had a brilliant background both as a dancer and now a teacher! So, to cut a long story short, I ended up a pupil of Bobby's. I recall my first class- I walked into his Glasgow studio and sat with about 10 other dancers of varying ages- and every one of them a champion dancer (Catriona Buchanan, Margaret Sampson, etc.) or a prominent prizewinner on the games circuit. He taught one at a time, placing each dancer between the backs of two wooden chairs on which sat two pupils to stop the chairs from moving. He stood behind you and you faced the mirror- so he could see your "front and back" at the same time. All the time, he was asking questions of all dancers at the class on the practical and theoretical side of Highland Dancing- keeping them all involved and alert! He'd put up 2 or 3 of us at a time to perform steps and dances and accompany us on his own set of pipes - only they were what is known in the piping world as a quarter set- a miniature version of the pipes with a quarter of the volume! I recall he would hold the mouthpiece in the left side of his mouth, puff on a cigarette which was in the right side of his mouth, and shout to us every now and again out of the centre of his mouth!! I spent about 6 years with Bobby and my dancing improved to the point that during my teenage years, my twenties and half my thirties I attended Highland Games and usually ended up with most of the prizes and overall trophy. So there's no doubt that Bobby was an excellent teacher-both practically and theoretically. I passed my teachers exam with the Highland Dancing Specialist Association. Charlie went on to start his own dancing school at the age of 16 and turned professional performing in thousands of stage shows and over 400 TV Shows including being a regular on "the White Heather Club" Charlie is an adjudicator with the SOHDA. Bobby Cuthbertson in 1947 was influential in establishing and developing the SOHDA. Who is this young man, whom according to the "Daily Mail" April 2nd edition is "following in the footsteps of "Billy Elliot"? Is he truly the Scottish version of the young man depicted in the film? "Billy Elliot" the North county lad from a mining town who discovers dance/ballet. Billy who faces ridicule, stereotyping, and an uphill climb to dance, to express the fire within. Billy who eventually over comes all the obstacles put in his way by the naysayers. 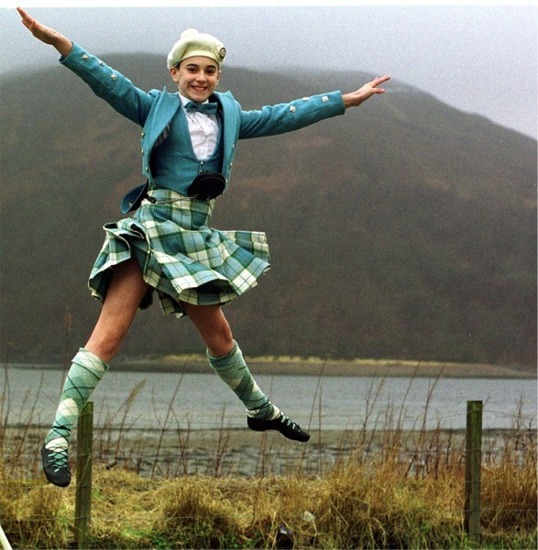 Has our Scottish version of "Billy Elliot" trodden the same path? Lewis Faryma has definitely faced some of the problems when a young boy decided to dance, the pressure of his peer group. Most male dancers have had to endure the names calling from other young males. Films such as "Billy Elliot" the revival of males dancing in shows such as "Stomp" and of course the Irish counterparts has certainly helped in quashing the stereotypical insults and helped to give a better understanding of the male dancer. Lewis mother is quoted in the Daily Mail "In the past Lewis has been ridiculed for his Highland dancing and ballet but he's always been single-minded in what he wants to do and has been able to ignore the comments. The film, "Billy Elliot" has helped promote male dancers and people now seem more accepting of what Lewis does!" Yes our "Scottish Billy" has indeed succeeded. His family will be moving from Glasgow to Fort William, so Lewis can concentrate on hewning his craft at the "Dance School of Scotland", Knightswood. The Scottish Ballet Junior Associates chose Lewis, a member of the West Scotland Ballet Company, in 1999 and he passed every exam with Honours. He competed at the British Imperial Ballet Awards in London; England in March was first in class. He has just passed an audition at the Dance School of Scotland where it was said, "he has a rare and exceptional talent!" A son of which Scotland can be proud! Yes, Lewis also dances the dance of his heritage Highland. He started Highland at the age of 4; by 9 he was the British Open Professional Juvenile Champion, City of Edinburgh Champion, Royal Highland Show Champion and many, many other titles to his name. By the age of 11 he had won the British Juvenile Champion three times in a row. A future "Cowal Champion" commonly known as the "Worlds" No! Scotland will not be represented on the boards by such an illustrious and talented dancer. Cowal Gathering and the Scottish Official Board of Highland Dancing has done what the rest of the naysayers and ridicule could not do. Cowal Gathering and the SOBHD have "stopped Lewis dancing" (at least the dances of his country). Why? Lewis does not belong to the group SOBHD that is in charge of the dancing at Cowal Gathering. Lewis has learned the dances of his fathers from another organization Scottish Official Highland Dancing Assoc. Although there are no restrictions from other organizations worldwide the Scottish Official Board of Highland Dancing will only let their own membership dance at the "worlds" (Cowal Gathering). You cannot belong to any other association and dance at Cowal. Lewis mother writes "However, despite his success he has never been allowed to compete at Cowal Gathering or any other competitions run by the SOBHD. This included his own local games at Lochaber, despite being born and bred here; he has never been allowed to compete. It is surely wrong to discriminate against anyone, especially children. Lewis has been denied the opportunity to compete in his own country in his traditional dance and at least try for a world championship title. It is surely a hollow victory to be called a "world champion" in a competition, which is "closed" to so many excellent dancers (note readers will remember another Scottish champion unable to compete for her country Braemar's 2000 champion Roo Killick). Lewis disillusioned with the Highland scene, caused by "closed" competition will study ballet full time and stop competing Highland at the end of the 2001 season. He is hopeful that there will be a change in the Highland scene, which eventually would allow him to compete at "Open worlds", but till then he will concentrate his efforts into the ballet." Hugh Bigney, SOBHD, World Champion Cowal Gathering 1973 and professional dancer when informed of Lewis' plight said "how sad for the young lad, but at least he is still dancing. Please give my support to him and his mother. Keep dancing!" Victor Wesley (non- SOBHD) Cowal Champion 1968,1969 and 1972 and Director of the Wilmington Ballet as well as "Academy of the Dance" reiterated Hugh's thoughts and " I have seen this young man dance he is truly something special and could be one of the future greats! It is criminal that he cannot dance for Scotland in the dances of his heritage, tragic!" The Scottish Official Board of Highland Dancing has over the years taken a lot of heat for their restrictive membership policy. The "dance for us and no one else philosophy" etc. However, are they truly to blame? Who is it that inevitably decides the fate of dancers like Roo Killick and Lewis Faryma whether they can dance at Cowal Gathering or any of the other "closed competitions"? Should not the organizers and boards of the Highland Games that allow the restrictive procedures to continue take the responsibility? It is this writer's opinion, the Board at Cowal Gathering as the "enablers" of restrictive dancing, take the blame for Scotland's sons and daughters not being able to dance for their own country in their own country! Are the Highland Games of Scotland and indeed worldwide blameless? No! Are the Highland competitions whose purpose is to "promote" the culture and heritage of their country doing so by restricting it's sons and daughters from participating in that heritage? I hope that is a question that Cowal Gathering and the other competitions worldwide will ask themselves. Hopefully Lewis will indeed become one of the world's great dancers and hopefully Scotland will not miss out again on a "Highland Great". If they do they only have themselves to blame! Please note all observations and opinions in this column are my own. I would hope that things will change again and "all" dancers will be able to dance for their country, whether Scotland, New Zealand, Australia etc. in a "World Competition" and Lewis and may share the platform with his countrymen.